Canada’s plan to tackle greenhouse gas emissions, the Pan-Canadian Framework on Clean Growth and Climate Change, sets a clear trajectory for transition in the Canadian economy. This is in line with the global economic shift to a sustainable economy increasingly driven by cost-effective technologies that offer investors a strong return on their investments, separate from any public policy considerations. Making the clean transition in Canada will require average annual investments of $158 billion per year from 2019 to 2025 across the building, transportation, power and heavy industry sectors, according to Corporate Knights estimates. Given the capital-intensive nature of this transition, the Canadian financial sector has a critical role to play to finance these transactions. 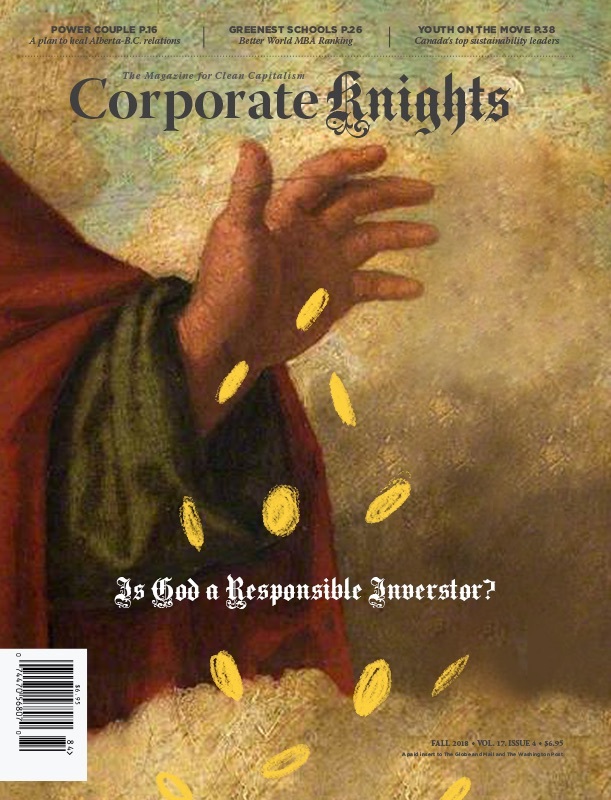 In an ambitious scenario, Corporate Knights estimates that by 2025 up to $110 billion in annual revenue will be available for Canadian financial institutions to reap. 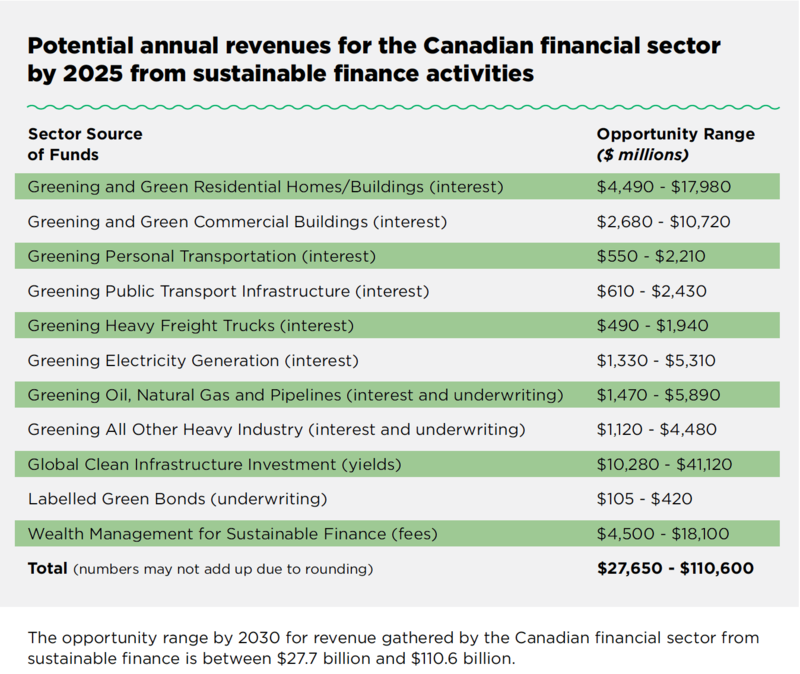 To put these results in context, the 12 biggest financial firms in Canada had total revenue of approximately $435 billion in 2017– the $110 billion in potential sustainable finance revenues could represent up to 25 per cent of current revenue. Sustainable assets under management are expected to reach US$63 trillion by 2025, driven by women, millennials and high-net-worth individuals. Many of the world’s leading wealth managers have recently ramped up their sustainable product and service offerings, including BNP Paribas, UBS, Morgan Stanley and J.P. Morgan Asset Management. Taking a more holistic approach to values-based investing represents a growth opportunity for Canada’s global banks and insurers to boost their already sizable assets under management (currently at $3.6 trillion) in the coming years. In an ambitious scenario, Canadian financial institutions could reap $18 billion in annual wealth management fees by capturing 5 per cent market share of the estimated US$63 trillion sustainable investment space by 2025, with cost-effective, holistic investment solutions that charge 0.5 per cent in fees. With respect to infrastructure, a global build-out valued at over US$24.7 trillion is anticipated between 2019 and 2025, with half of it being financed by investors and the lion`s share occurring in emerging markets, which also happen to offer superior yields. Six of the top 12 infrastructure investors in the world are from Canada, including Brookfield, CPP Investment Board, Ontario Municipal Employees Retirement System (OMERS) and Ontario Teachers’ Pension Plan (OTPP). Leading pension funds that set the standard for how Canada’s $3.6 trillion in pension assets are managed are already leveraging this opportunity, with Public Sector Pension (PSP) Investments and OTPP leading the way. In an ambitious scenario, Canadian investors would provide 2.5 per cent of global sustainable infrastructure funds focusing on emerging markets, which would mean injecting about $100 billion per year on average starting in 2019. At an average emerging market debt yield of 5.8 per cent, this would generate $41 billion in annual yields by 2025. Activity of this scale would also represent additional opportunities for the capital markets teams at the banks to facilitate this large allocation of capital with investment vehicles, derivatives and currency hedging instruments. The Council for Clean Capitalism is a group of forward-thinking companies that seek public policies in support of an economic system in which prices incorporate social, economy and ecological benefits and costs, and people know the full impacts of their marketplace actions.